Jake Lonergan: I woke up in the desert like I’ve been dropped out of the sky. For a movie titled ‘Cowboys & Aliens’ to play itself completely straight, it sure does come off as awful silly in many instances. More importantly, the film comes off as very dull in many instances, which is quite unfortunate. Despite having a big name cast, big name producers, a big name director, and eight credited writers, not much beyond having both cowboys and aliens in the same movie was done to make it more enjoyable. I was hoping it could deliver, as this film was one of my most anticipated of the summer; however, it lacks anything beyond the strength of a good high concept. There is no real pulse here and beyond seeing James Bond and Indiana Jones in the same movie, neither of them leaves any real impact, which is unfortunate. The film does have a strong setup and there are brief moments of fun, but overall, this film doesn’t quite lasso itself a win. The film begins with Daniel Craig’s character, Jake Lonergan, waking up, once upon a time in the west, with no recollection of who he is or how he got there. Confused and wounded, the real mystery is a mechanical gizmo clamped around Jake’s arm. A group of bandits attempt to string him up, but Jake quickly subdues them and begins his ride into the nearest town, known as Absolution. Once in town, things quickly head south for Jake, as he is apparently a wanted man. After a brief scuffle of sorts, Jake is about to be taken to jail in another town, until the arrival of a tyrannical rancher, Col. Woodrow Dolarhyde (Harrison Ford), escalates issues further. It seems that Dolarhyde and Jake share some sort of history, but that is going to have to wait. While Dolarhyde argues with the sheriff (Keith Carradine) over custody of Jake, the arrival of something out-of-this-world really stirs things up. An attack by lights in the sky leads to many explosions and the taking of many of the townsfolk, including Dolarhyde’s son, Percy (Paul Dano). Jake intervenes due to the sudden activation of his “wrist metal”, which enables him to shoot down one of the ships in the sky. With next to no idea what is going on (“Is it demons?”), Dolarhyde, a reluctant Jake, some other townsfolk, and the mysterious (and mysteriously clean and beautiful) Ella (Olivia Wilde) set out on an adventure to rescue all of their kin and hopefully come to understand what otherworldly creatures are out there in the wild wild west. I mentioned early on that the film is played completely straight, which is commendable. The film has such a bizarre story as it is that the last thing needed would be to try and have a knowing “wink” at the camera as we went along. However, it does not help that this film almost downplays the premise too much. Despite seeing alien spacecraft, slimy creatures, and other such sights, no one ever seems too overwhelmed by any of this, practically taking it in stride instead. It is an issue like this, which I think solidifies some of my thoughts on the next major issue. This movie is all plot, without much room for character work. While it develops its story and establishes a set of people involved, the film never really stops to care about any of them. Instead of learning about who some of these people are in a natural sort of way, we simply get told what it is that make these people tick by other characters. Ford’s character is supposed to be a grizzled veteran and former leader of sorts, but we don’t really see it in him, we just see an angry man, who sometimes tells stories and other times seems ready to abuse his authority over others. Craig’s character is the mystery of this story and is handled as such, but the rest of the cast gets very little to expand on. Wilde has the most frustrating task of being a character forced to hold back revealing information simply because it is not written for her to do so yet. Moving on, the idea of mixing a western and a science fiction story about aliens together is easily the most intriguing part of this film. Unfortunately, the story presented and the designs involved for the aliens did not help any of this work out better. No other way to say this, but the reasoning behind the aliens’ presence on earth was laughable and their design lacked a crucial element – being scary. Instead, we are presented with bug-eyed claim jumpers, who have an inconsistent amount of strength and for some reason gather up as many humans as possible, whenever they feel like showing up. It is fortunate that the setting lends itself to some great scenic shots, combined with some cool CGI; it is just too bad that something more interesting was not done. 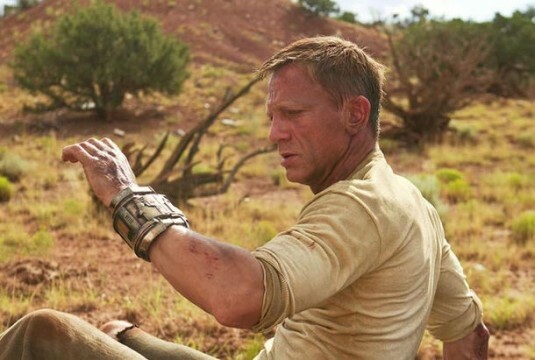 To the film’s credit, having Daniel Craig and Harrison Ford in lead roles was a strong step in the right direction. Even if they do not get to have great scenes to play against one another, each gets their one or two moments to shine separately. I was annoyed to see the supporting cast get so little to do, other than Paul Dano, who was just really annoying himself. Having someone like the great Sam Rockwell be boring on screen is definitely the fault of an undercooked screenplay. While the film was originally developed simply because of the imagery scene on the cover of the comic that inspired this story, it really does not feel like much attention was paid to having stronger ideas for this kind of potential blockbuster. Director Jon Favreau starts the film off quite strong, throwing us into the shoes of Jake, as he tries to figure out what the hell happened to him, but following the first alien attack, this film veers off into blandness. 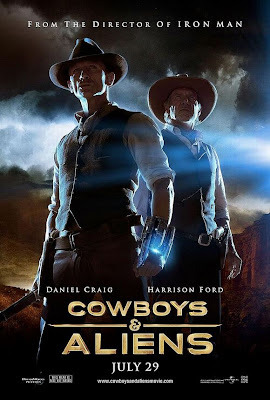 It is not very well paced, with little going on in between the scenes worth mentioning and the big “Gunfight at the OK UFO”, which takes place at the end, lacks more impact than it should have; coming off as somewhat confusing and mostly on autopilot, as we watch Craig blast alien after alien with his magical bracelet. 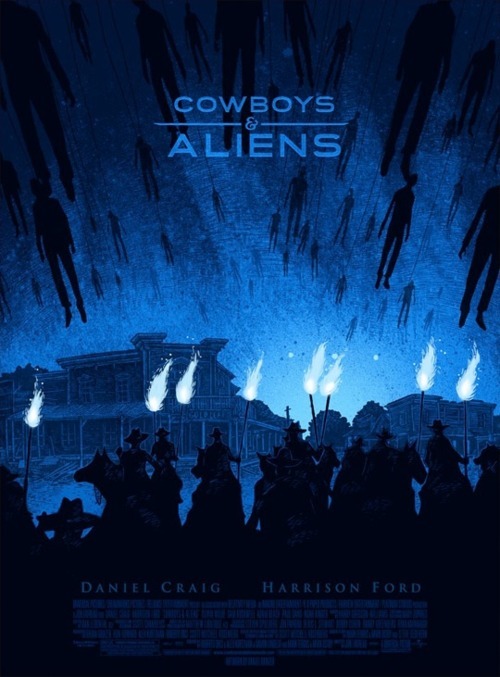 Cowboys & Aliens is by no means a disaster, just an unfortunate end result of a product that was filled with much more promise. I am all for silly blockbuster entertainment, but this film lacks something greater, given the amount of talent involved. 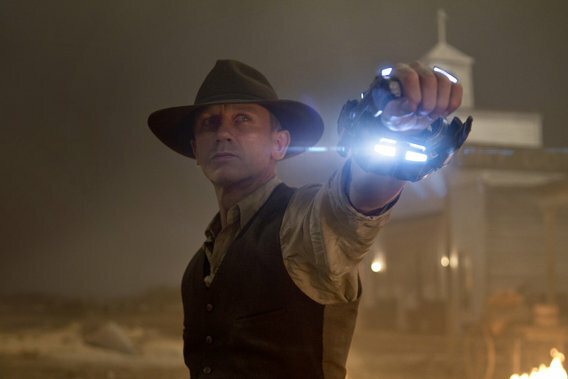 There is a general amount of joy in seeing Daniel Craig jump off a horse onto a flying alien ship, but there is also still the matter of the film lacking compelling characters or achieving grander action moments that would do a sci-fi western proud. There was a good concept, bad execution, and some ugly aliens. Ella: I need to know where you came from. Jake Londergan: So do I.